The coins of the Irish Free State use Gaelic descriptions for their denominations, and they are presented in an unusual font. When I say "text on coins", I shall include numerals too, because I am making a distinction between the pictorial and non-pictorial elements of the design. The English numismatic designer Percy Metcalfe was famous for the distinctive art deco style that he brought to his designs. He even extended this to the numerals he used. Here is an example on the Bulgarian 100 leva coin of 1934. The numeral 9 in the year 1934 appears particularly angular and stylised. Here is the reverse of an Iraqi 4 fils coin, dated 1938. On the left-hand side, Metcalfe shows the numerals of the Western calendar year in Arabic style, while on the right-hand side he shows the local cultural version, again in Arabic style, but both are highly stylised, and I have not seen anything similar on the coins of other countries that use Arabic script. 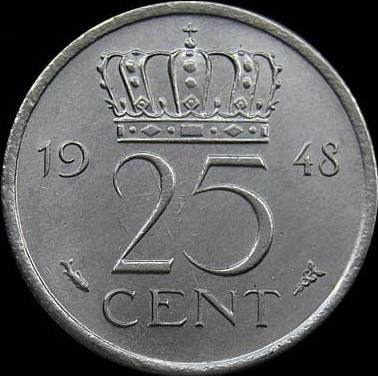 The numeral 5, as used on this Turkish 5 kurus of 1942, is also highly stylised, and reminiscent of some of Percy Metcalfe's numerals, though I do not know who designed this coin. The fonts chosen for denominations can be quite varied. They are also often very noticeable, since the numerals of a denomination of a coin often dominate the design in a way that alphabetic text rarely does. The numerals on this Dutch coin are rather fancy. 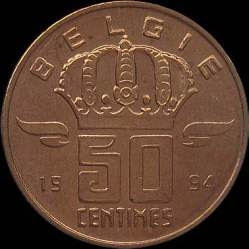 The 50 on the Belgian coin is rather unusual. The rather plain but elongated numerals on this coin from Luxembourg still make a statement. An arty looking font is used for the text and numerals on this Spanish commemorative coin. An innovative "50" on a 90-year-old Romanian coin. Whenever I look at this coin, I think that the zero doesn't go with the five in the "50" denomination. 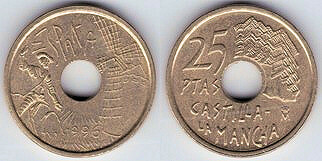 The numerals on some coins are outlined, but the outlines on this Maltese 50 cents are carefully filled in with horizontal lines. Such elaborately designed numerals are less common these days, I find, but I always enjoy looking at them. A fancy 5 on a Danish coin of 1874. 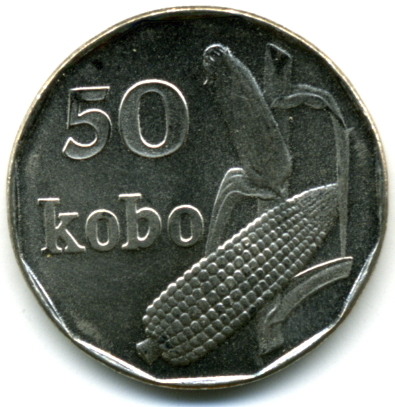 A particularly unusual 50 on this Gambian coin. By his style shall you know him. 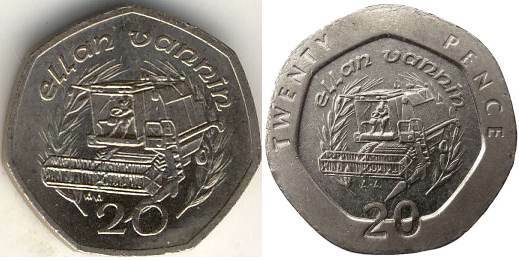 This Swaziland coin and the Gambian one were both designed by Michael Rizzello. The legend overlays the denominational numeral on this coin, but it is large enough and distinctive enough to shine through. Ceylon became Sri Lanka, and here the same trick is used again. Here are two coins from the Isle of Man. 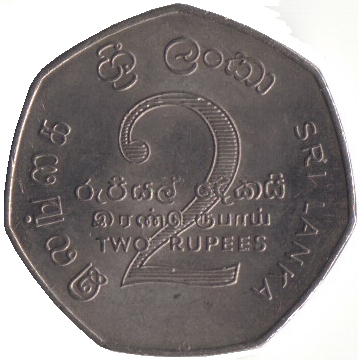 The coin on the left is dated 1992; the coin on the right is dated 1993. Notice how the numerals straddle the countersunk area on the second coin. On these coins of Papua New Guinea, the crocodile's tail obscures part of the denomination (one kina). The font used for Devanagari is different than what we usually use for our coins. The numerals on Algeria's modern coins are like no others.